Help me thin out my drum collection! Buy drums! They come infused with powerful, positive energy. They are fun and therapeutic and spiritual and wonderfully noisy! I used to only sell drums to members of my drumming circle. I find them cheap, I sell them cheap. So why not keep them 'in the family' so to speak? But then, I think I may have oversaturated my market...One day someone asked for a show of hands from anyone in the group who had NOT bought a drum from Rick. No hands were raised...everyone just laughed. So, I tried putting some drums for sale here on my website to see what would happen. 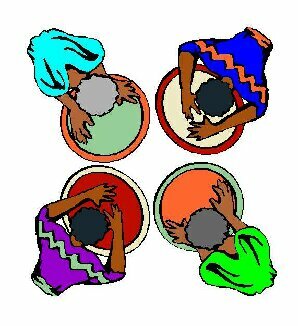 It has been a success so I'm launching Healing Heart Drums. To see what drums I'm presently selling from my collection click on the "drums for Sale" link at the bottom of this page. Below is an example of the drums that I build. They are made of either red mahogany or purpleheart wood with elkhide heads. This is a huge jump in quality from the thin, soft cedar frame drums with the picture silk-screened to the head by a manufacturer. Most cedar drums eventually buckle from the pressure of the animal hide. Both mahogany and purpleheart wood create a drum that will be passed on for generations. 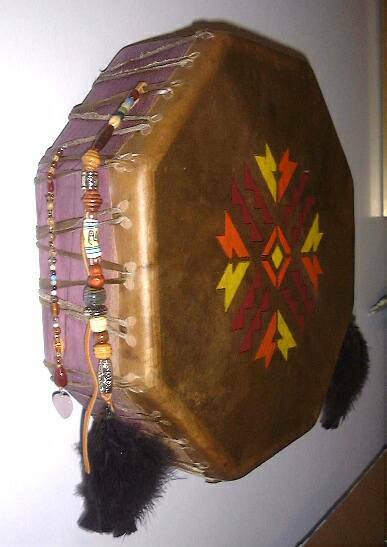 My Healing Heart Drums are built one at a time. No two are alike. They can be custom built with your favorite colors or gemstones in mind. Imagine a piece of your own clothing or someone special's to be used in the crafting of a beater. It's a powerful way of infusing a drum and beater with personal energy. Interested? Email me and we'll talk.